The fans are unhappy, well lets say ‘irate’ over Wiggins dropping the bombshell to the British public, that one of their fondest sporting icons will not be chosen for the Sky Team for the Tour de France. This is the culmination of a series of problems running right back to the 2011 Vuelta Espania, where the physical abilities of Froome & Wiggins were first seen in direct comparison. This led to power struggle within the team which was never dealt with satisfactorily, the Sky management & initial premise the team was set up on are to blame. The riders are only doing what they can to protect their own positions, after all other avenues have failed, I blame the team, not either rider. Dave Brailsford lost the changing room a long time ago, fluffy management & a failure to imagine the consequences of that are now hugely evident, it looks like madness to not have dealt with conflicts a long time ago. When Team Sky was launched, the public were led to believe that it was very close to Team GB, which was further accentuated by the sharing of resources, specifically the staff & management. Dave Brailsford was taking on a dual role, having had incredible success with the track team & produced multiple gold medals, he was put in charge of both Sky & GB, although only recently he’s assumed only Sky leadership. In hindsight, we can consider that a grave error. Sky was portrayed to the public as an accentuation of Team GB, a very British team, continuing the Olympic success into the trickier, but much more lucrative & competitive world of professional cycling. One week we’d see Brailsford in his Sky kit, the next he’d be doing an interview in the GB kit, the general sports fans would have assumed that Sky & GB were one & the same, it’s unthinkable for a top football team to have the same manager as the national team, surely they’re the same? Again, in hindsight, we can look back & see that this was never going to be a suitable arrangement in the long-term. A professional team funded by one of the most ruthless media empires on the planet, running alongside a team based on winning medals at the Olympics. One hugely commercial & value determined by media exposure & increasing sales, the other based on a four-year cycle & the value based on the ‘feel good’ factor of a nation. These two contrasting motivations are mostly incompatible, but only occasionally cross over, was it correct to have the same people running them? Sky was seen as a place for young British riders to develop their talent, it’s the place to avoid now, as shown by the Yates brothers going to Orica Green Edge instead. They were fully aware that they would be used as lower slope cannon-fodder for Froome or Wiggins, which wasn’t the best option for their career progression. Take Peter Kennaugh as a prime example, huge talent, but not given the chances he deserves & put in positions where he can’t show his talent or learn to become a leader. Other teams would revel in having a rider like him, but Sky’s formulaic approach to stage racing ignores the majority of riders they have in their ranks & their ability to win races, or stages of major events. In many people’s eyes, Sky WAS Bradley Wiggins, he epitomised it’s Britishness, with his RAF logo & the Olympic throne image, further accentuating the blurring between Sky & GB. With Wiggins now likely leaving, perhaps Brailsford can look on this as a new dawn, he can put to one side his previous pressures from the British public to put national icons, or British riders first. They’ve been hugely successful up to now, with multiple stage race wins & two Tour de France victories. But as things are, things have to change to manage the expectations of all their riders, not just a handful of ‘favourites’. Sky need to keep riders happy, which is where an effective managements team & strategy is required. Sky doesn’t have that, their clinical approach to stage racing is being copied by others, but their man-management certainly is not. In order for Sky to progress & keep their sponsors happy, they now need to change tack. Taking the incredible hard-line on removing anybody who had any links to doping is now looking like a bad move, while those staff members had their faults, they removed access to the people who would be able to manage the current situation very well. Those who understand the sport, have ridden in teams where there have been huge ego wars & know how to sort problems. Maybe it’s time to rethink that strategy, to soften it a little & stop the same thing happening over again, rather than removing an entire generation of experience from having an input. When riders have to resort to releasing books to determine harmonious Tour squads, or appearing on rival news programmes to your team sponsor to put their side of the story across, the management have failed. In fact, its complete madness to have allowed things to get into the situation they are currently in. Two huge talents, whose personalities have been dramatically mismanaged since 2011. Both have released books in which they report the strains between each other, hopefully what we are seeing now is the bottom of the pit & things can improve. There’s a danger that if the expectations of riders are not seen to be managed correctly, then Sky will only attract a certain type of talent. The ambitious young riders may stay clear & seek other teams to learn their craft, left with the mid to late career riders seeking a payout rather than glory, remember that team the Texan was on, with him & a bunch of old guys on good salaries. Nobody wants to see that happen to Sky, but the kind of public ‘bust-ups’ that we’re seeing now are only going to turn the team in one direction. Sky need to offer opportunities, realistic ones to all their riders. Riders need to share leadership roles during the season, could their classics seasons be an example of how this is something seriously lacking, maybe their riders simply don’t know how to lead a team due to having never had to? Various riders have commented on that, including Ian Stannard in Rouleur last year, they need opportunities & team support, not just in maintaining wattages to burn off the competition, but to win when others are individually stronger than yourselves. We generally call this ‘tactics’, something which are generally absent from the best performing events for GB at the Olympics. Brailsford tends to call this ‘not able to control’, what he means is he doesn’t know how to control it if it’s not based on simply having more watts than the next guy. There’s a danger that Froome is going to hated by the UK public when the Tour arrives in the UK if this continues in the press. This isn’t correct, I think the venom is aimed at the wrong target, the target isn’t necessarily Dave Brailsford, but a team’s ethos, projected image, lack of experience & poor management. They’ve made a series of blunders which have led to the extreme measures both riders have taken to try & protect their positions. I do have faith that Brailsford can pull this back if he’s given the opportunity, I think he’s a man who can learn from mistakes, losing Wiggins may be his saviour, it may also be Wiggins, allowing him to fulfill his potential, which is still huge. Sky are left with a potential multiple grand tour winner & a wealth of talent, if used wisely & nurtured correctly, then it can flourish across events outside just the major stage races. They also need to reconfigure their staff recruitment policies & get some (maybe just the one) big-ego hard liners in to sort out any future conflicts, I wonder how much Bernard Hinault is charging these days for conflict negotiation duties. Brad in the Team Sky ‘Death Star’ bus. 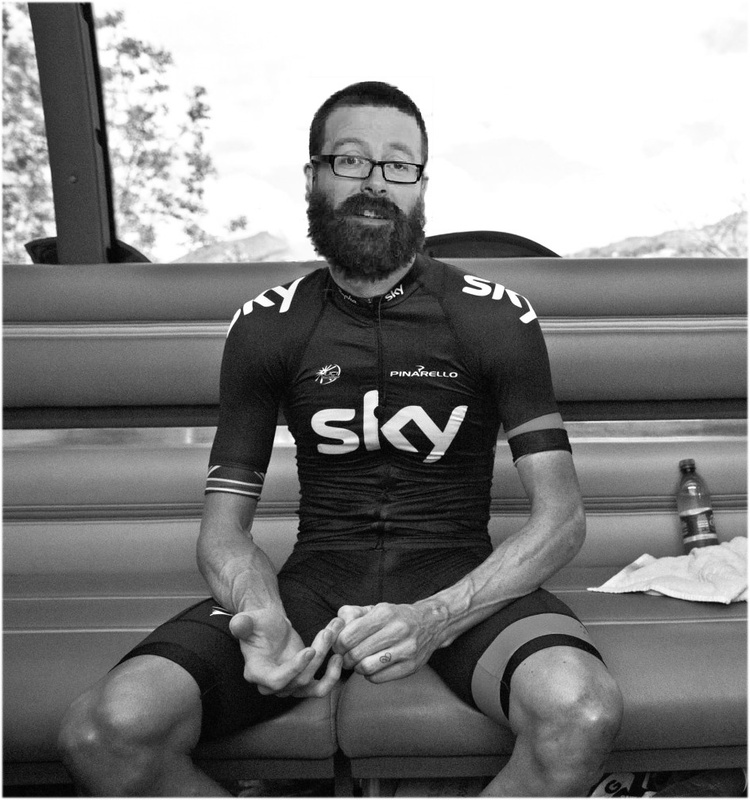 A source close to Team Sky has provided some startling information regarding the motivation behind newly bearded Bradley Wiggins decision which was announced today, that he is taking part in the Commonwealth Games time trial in Glasgow. It transpires that the choice may have been heavily influenced by some new-found friends he encountered during his ‘winter of discontent’ after his 2012 Tour de France victory. Brad allegedly fell asleep on a train after a particularly wild night out in Manchester, then woke up in Glasgow Central station several hours later. Not wanting to waste the trip, the Olympic hero decided to explore the local culture as an accidental tourist & happened upon Glasgow Cross, where the patrons of the long-established Tollbooth bar welcomed him in with open arms. There he entertained the locals for two whole days with his tails of conquering France & the finer points of cultivating facial hair, the latter of which was a speciality of many of the regulars. During this time many stories were told of the amazing opportunities that exist for bearded gentlemen that simply did not exist for the sideburned Sir, his mind was made up & a full beard was planned for Glasgow 2014. Not only would this provide some additional warmth for the Scottish summer (marginal gains), but he would also win the hearts & minds of an otherwise potentially hostile public, not partial to a shaven legged Englishman, wearing a St Georges cross skinsuit in Glasgow City Centre, just a few weeks prior to the referendum on Scottish Independence. With the finest ginger beard seen on the face of any professional cyclist the world had ever seen, he could woo the Scottish crowds & this time sit on the Commonwealth throne (rather than the Olympic one) as his rivals recorded their times on the leaderboard. The scene was set for a relatively relaxed 2013 race programme, followed by winter 2013/2014 spent cultivating the secret weapon, the fastest ginger whiskers in history, designed to create adoration from the Scottish public. Then a full assault for the Glasgow 2014 Time Trial title as his primary objective. As it’s transpired, this is exactly what is happening. A source close to somebody who watches ‘The One Show” has confirmed that Hugh Porter will not be the BBC commentator during the Commonwealth cycling events, but instead they will be using Brad’s close friend & doppelgänger Frankie Boyle, also a big fan of the monarchy. Unknown to most, Frankie is also a keen cyclist & has an in-depth knowledge of the finer points of aero helmets & race pacing, it should provide much better coverage that Hugh’s constant “full of riding” commentary we see in every event. The post race interview with Brad & Frankie is scheduled to be broadcast after 9pm for some undisclosed reason, so Frankie’s wife Susan Boyle will be interviewing riders during the daytime & providing post race soundbites. In a recent poll of attitudes towards Bradley Wiggins from a wide demographic of Scottish cycling fans, it showed a very large swing towards “Good Guy”, in a stark contrast to a pre-beard poll which showed the majority chose the other option. The strategy appears to have worked well & I urge all spectators to cheer on Bradley when you see him on the course. He’s certainly made a huge effort & deserves our support. If you’d like to meet Brad after the time trial on 31st July, it’s almost certain you’ll find him in his favourite Glasgow bar, seeking advice on his next career goal. Bradley Wiggins, after an outstanding 2012 is struggling to come to terms with an ordinary 2013, lets take a look at how that might have come about. Lets not forget just how stellar a year it was for Wiggo in 2012, here’s a list of his main achievements during the year. He won Paris Nice & almost everybody wondered why he was peaking so early, then at Romandie we were astounded, he’d kept that peak going. Moving on to the Dauphine & we were sure he had peaked to early on the run up to the Tour, then the Tour came along & he took that too (although we don’t really know how strong Froome was, or if he was stronger would he have been mentally ready to lead the team). Finally the Olympic Gold medal was taken in London in front of huge crowds. An incredibly hard season to follow, most riders would be legends winning these events over an entire career, let along one season. We really have no idea about what effect maintaining his 2012 form over a long period of time has had on Wiggin’s body, let along his mind, the discipline he ruled on himself must have been incredible. We also have to factor is the stardom effect, after a year like that he’s moved from somebody most people had heard of to a household name in the UK, the media demands are huge for somebody thrown into that kind of fame over a relatively short period of time. In order for an ‘engine’ like Wiggo to perform against the climbers, he has to run at an incredibly low body weight, which we presume a Sky doctor is constantly monitoring in order to keep him healthy. So we can also presume that a body fat percentage like that is a fine line between staying healthy & performing incredibly well. Perhaps this is one of the reasons that he’s been unable to maintain the kind of form he enjoyed in 2012, maybe it’s impossible for the Sky backup team to factor in all the appearances he had to make in winter 2012/2013 in relation to his relative public demand in the winter of 2011/2012, where he’d really only won the Dauphine & it has very little public perception in the UK. So far in 2013, he’s finished 5th in both the Giro del Trentino & the Vuelta a Catalunya, with some mechanical problems adding to the disappointment. In the Giro we were having to come to various conclusions as to what was going wrong, be it form, illness, motivation, or a mixture of them all, which resulted in having to withdraw with a chest infection. There’s no reason to believe that Wiggins didn’t have a chest infection at the Giro, but I’d ponder that a chain of events have led to this being the case. Possibly started by a lack of motivation, after all, what exactly did he have to prove by re-running the 2012 season, which as he stated himself, would have been a failure if he didn’t surpass what he achieved last year. So the Giro was targeted, but can we be sure that the Giro is as motivationally tempting to him as the Tour, regardless of what’s said in press conferences, we’d imagine not. So this leads to my motivation pondering, can a lower level of motivation lead to an athlete becoming ill? Take the winter of 2011/2012, Wiggins knows he has the ability to win the Tour, the following year is made for him, he decides to give his all to turning up at the Tour is the best shape possible. He knuckles down & lives a life none of us can imagine, carefully controlling absolutely everything in his life, he does this for a full year with one thing in mind. Now we move on to the winter of 2012/2013, he’s won the Tour, the next year’s is going to be a harder course for him & he also knows that his team-mate will be less inclined to hold back this time, a team-mate who it niggles him in the back of his mind may have had the ability to beat him without team orders. Wiggins has to be better than 2012 in order to win the Tour again, he has to be better to even have team leadership, in all likelihood he’ll be a super-domestique for Froome if he concentrates on the Tour. He doesn’t take quite as much care of himself (still living a life of discipline none of us can really imagine), he has huge demands on his time, his recovery time is affected massively, with travelling, functions, late nights etc. If you take a step back & look at what Wiggins has had to endure during the winter, demands far above what he’s ever been used to in the past, 2013 was always going to be a disappointment. He knew he also had to improve to do the same again, so he focussed on the Giro instead and reshaped his calendar around that. Essentially he lowered his targets to some extent in order to focus on different goals, it was a plan that may have worked, but a weather stricken Giro, form not at 100% & a stunning Nibali put and end to those hopes rapidly. Brad had to go deep into his reserves, presumably with an incredibly low body fat percentage, slightly lower form & unseasonably bad weather in the Giro, all added to something Sky couldn’t control & the wheels came off the wagon. We don’t know what would have happened had any factors been different, but Wiggin’s team-mate eventually finishing 2nd (at over 4 mins) shows that had things gone to Sky’s plan, Brad would surely have been expected to finish above Uran, i.e much closer or ahead of Nibali. But looking at it, it seems unlikely that the Maglia Rosa would have been on anybody elses shoulders, Nibali looked like he still had an extra gear he had no need to use against the competition that surfaced in the final week, I think he would have won anyway. Wiggins is suffering from a bad knee, as reported today, but when things go wrong, the little things seem a lot worse. Take the mechanical issues in Wiggins early 2013 season, you could feel the frustration bubbling over what he would have taken little issue with in the past. The report suggests he’s still able to train, but could this be another poor PR gesture from Sky, who are really between a rock & a hard place on this, when you’ve got twitter participants like Froome’s girlfriend suggesting that there’s no way Wiggins will be riding in the same team, in the same race as Froome (remember ‘Wagwars’ from last year). My guess is that he won’t be on the start line in this years Tour, or any others for that matter. This isn’t a blog about slagging Bradley Wiggins, it’s more about understanding what he’s been through in order to perform as spectacularly well as he did in 2012, then the fall out from that effort in body & mind. He’s proven what he can do & anything less in any further years would be a let down. I expect him to retire from professional cycling at the end of the year, he should be applauded for what he’s done to the profile of the sport in the UK, he’s taken the brunt of many Team Sky PR blunders & if motivation isn’t going to rise above knee level, it’s maybe time to step away from bike racing while he’s still at the top. Wiggins suffered many years of living on the fringes of nearly making it big time, he doesn’t need to do that anymore, he’s set himself up for life. Brad, you’ve done us proud, you’ve also earned millions, don’t screw it up now, enjoy the rest of your life without having to worry about pedalling a bike fast, you earned a pittance doing that for too long, it’s time to enjoy the spoils of war, don’t get any more scars, life isn’t bike racing, it’s just one small (but necessary) part of it.